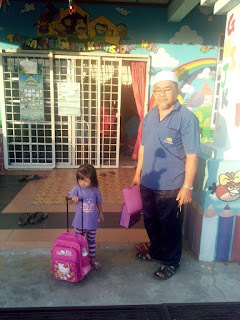 Princess R started her kindy on 3rd Jan this year. At that time, she was 2 years and 4 months old. She was excited about going to the kindy on the very first day. Her new pinky bag made her more excited I guess. However, Princess R was lucky enough that Tokwan and Tok could send and accompany her. 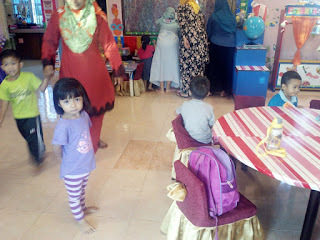 Here are some pictures of her on that special day. Just looked a little puzzled by the new surrounding. I'm miss writing like seriously. Maybe it's time for a comeback.